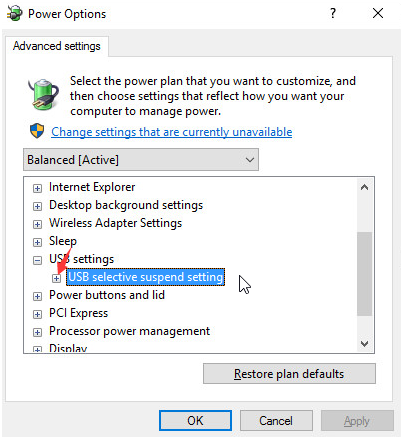 How To Fix USB Malfunctioning Or Flash Drive Not Recognized In Windows Computer. USB is an acronym for Universal Serial Bus. A USB is a commonly used hardware that serves as an interface for attaching peripherals to a computer. Peripherals are devices that are outside the computer's system unit. Examples a printer, scanner, keyboard, mouse, camera, hard drive, USB cable, modem, flash drive etc. √ All theses peripherals are attached to a computer system via a USB port. √ A USB hub is used to provide more connection spaces to a computer. √ A computer system has at least two two USB ports. √ USB malfunction or not recognized can occur on all Windows operating systems. USB error or malfunction had for long been an issue that computer users face or experience when they are trying to connect to an external drive or device. Many of us had in one time or the other experienced or still experiencing what we are discussing here today. And might have created fear in you that your computer is damaged just because you're unable to perfectly connect your phone or any external device to a computer. Here, I will be stating all the causes of that error "drive not recognized" and below each of the problems will be their solutions respectively. Okay, let's go. If the USB port or connector is dirty or damaged definitely, it will not display any peripheral connected to the computer. To be sure if it's really the USB port that's not working, remove(unplug) that flash drive and connect it to another port on the same computer. Not still recognized by the computer ?. Connect to another computer, if recognized then it means your own port has a problem. Switch off the computer. Take a small portion of Cotton wool, soak into methylated spirit. Use it the gently to clean the usb ports. Wait for 7mins for it in dry up. 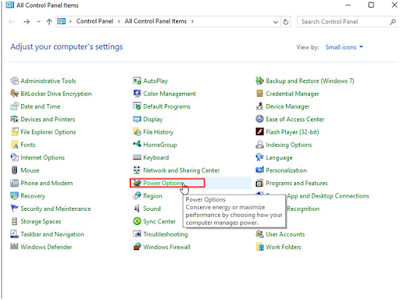 Switch on the Pc and connect your flash drive again. If it work...good job!. And if it didn't then you will have to take the Pc to the engineer. Or you will consider getting a new one. A times it is due to the heavy load of peripherals connected to the PC which might in turn stop other devices from working properly. Unplug all devices. Now, plug only one to the PC. Not working ?. Proceed to the next step. Your usb driver is outdated and you're expect to work?, oh no!. Use Windows update to check if you need a new driver for your device. Install update package. 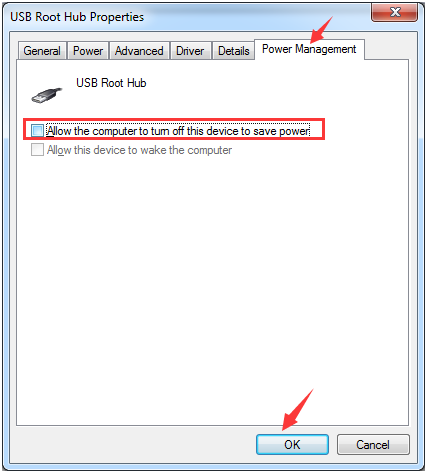 This will automatically diagnose and repair all USB problems on windows 7 to 10. Click on => Download Now . Run the file and follow the steps in the Windows USB Troubleshooter. If you're not on the computer having the problem kindly download this file and save on a CD then use it from there. This method will help to fix a corrupted or unstable USB controllers by reinstalling the controllers. Goto "START" menu on your computer search "DEVICE MANAGER" .click on "Device Manager". Click + sign to expand "Universal Serial Bus controllers". 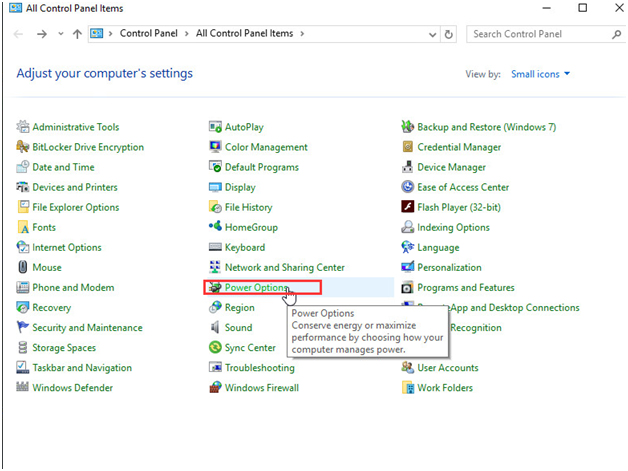 Press and hold (or right-click) a device and select Uninstall. So, repeat for each device. Once you're through with all, restart your the computer. Now, your USB controllers will be installed automatically. Test to see if it's now working. Note : If the problem persist proceed to the next step. Goto control panel and click on " power options "
Click on " Change plan settings". 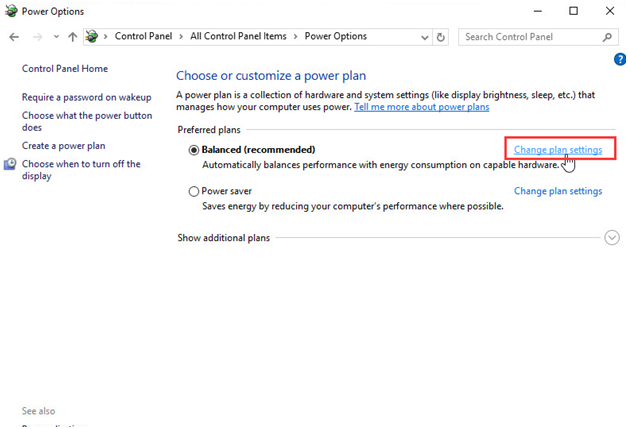 Click on " Change advanced power settings ". 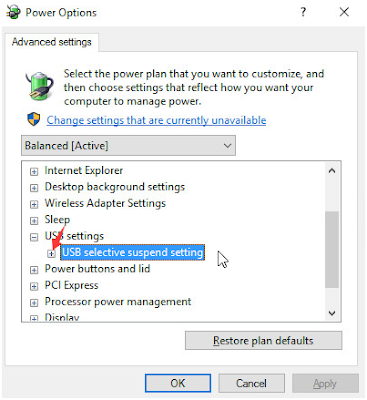 Expand USB settings and USB selective suspend settings. Disable both On battery and Plugged in settings. Click on "Apply " and the " OK ". 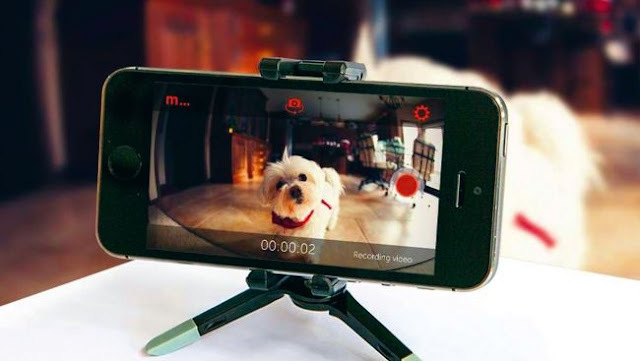 Not still working ?, try the next solution. Once again, open Device Manager . click + sign to expand Universal Serial Bus controllers. 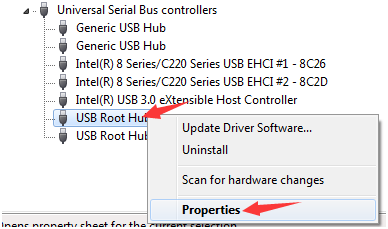 Right-click " USB Root Hub " option and click " Properties ". 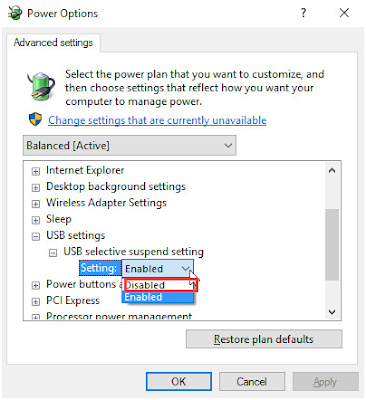 Go to " Power Management " tab and untick the " Allow the computer to turn off this device to save power ". Click OK. If you have more USB Root Hubs, you need to repeat this operation a couple of times. And always remember to click " OK " after each performance. 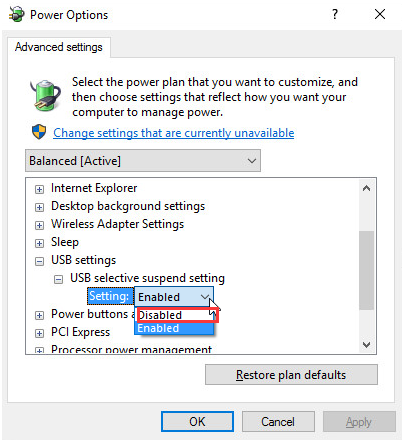 After the settings, connect your USB device back and test if the computer can now recognize it. Unplug and plug your power cable from the CPU (central processing unit). Plug it back. It will hard reset your CPU and in turn make you computer's software to recognize the hardware which is the flash drive. This is the last method I'm giving out because this is the last resort of others fail. Install your motherboard's latest chipset drivers so that your drives will be recognized. After that, kindly visit your computer manufacturer's support website. There you will be privileged to access the list of computer manufacturers' support sites. Just like the list of computer manufacturers here. Also Read : Prolong Your Laptop's battery Life With These Simple Tricks. You've been able to learn all the methods on how to fix usb malfunction or flash drive not recognized problem on windows Computer do well to share this post to your social media timelines. If you have any question don't hesitate to type in below comment box. Enter you email below to subscriber to daily hot techs solutions and tips like this.